By Jordyn Grzelewski | May 3, 2018 at 12:01a.m. When township police Sgt. 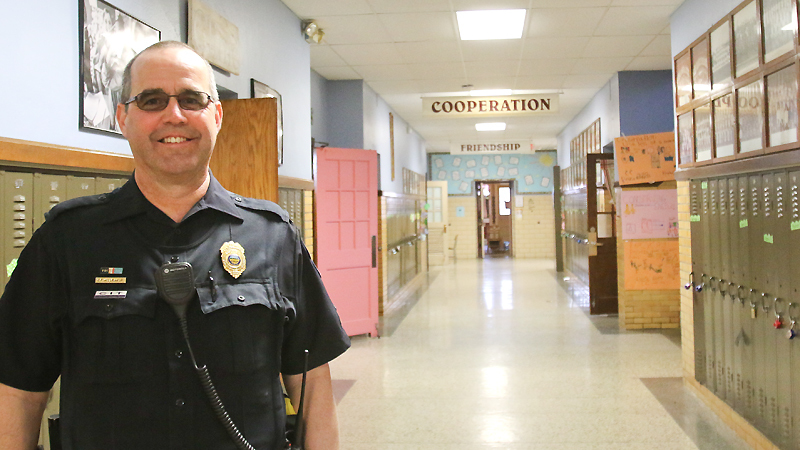 Chuck Hillman began working as a school resource officer 15 years ago, he was the first township officer assigned full time to the schools. Now, with numerous experienced officers working in the schools, Hillman feels confident passing the torch as he transitions to a new job supervising the township police department’s emergency dispatch center. Those who have worked with Hillman over the years praised his ability to build relationships and credited him with strengthening the bond between police and the school district. Hillman started working at BPD 28 years ago after starting his career as a police officer in Liberty. He said he wanted to work in the schools for the same reason many people go into law enforcement: to make a difference and help people. “Being in the schools, I saw it as an opportunity to do that and do it with a segment of our population that is sometimes at risk,” he said. His favorite part of the job has been interacting with students. Now, there are four officers stationed in the schools full time. Hillman supervises the SROs, handles investigations involving juveniles, works at the elementary schools and leads the department’s juvenile-diversion program. He will be replaced by Sgt. Mike Sweeney, who has been with the department 13 years. School officials said Hillman will be greatly missed. High-school Principal Cynthia Fernback recalled many fond memories of working with Hillman and described him as someone who rarely gets angry – and when he does, can’t stay mad for long. Associate high-school Principal David Kornbau recalled that when a new administrator started working at the high school, they asked how honest they should be with Hillman when discussing situations at the school. “My answer was ‘we have no secrets from Sgt. Hillman.’ He’s one of us,” Kornbau said. May 26, 2017 12:05 a.m.
July 1, 2017 12:07 a.m.
February 24, 2017 12:05 a.m.